I picked up the Caylors last season with the intent of using them as a powder specific ski. I ended up using them almost exclusively, logging in a little over 95 days on these boards on every snow type imaginable. The first thing I noticed while mounting the bindings is the ski’s center mount. It looks way too far forward. The center mount helps tame these beasts on the hardpack, and makes any size turn possible. Generous tip rocker keeps the skis on top of the snow on even the deepest days. Underfoot the ski has basically o camber (1mm if your splitting hairs) but the bamboo core still gives the ski a poppy feel, while the weight keeps the ride damp. I used this ski as my primary backcountry rig, and while it is heavy, it’s weight I’ll gladly carry around. The skis are overbuilt. Durasurf 4001 bases and 2.5mm Rockwell steel edges can take a lot of abuse. I seem to find a lot of rocks throughout the season and these bases have only scratches where other skis would be missing Ptex. 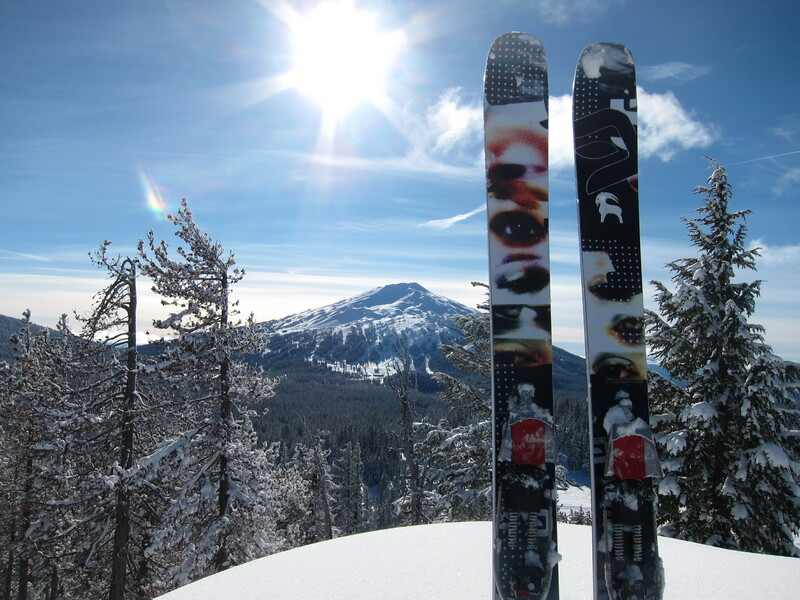 Powder conditions is where these skis shine (as they should). Carve, slarve, run ’em, dump speed, short turns, long turns, doesn’t matter, they do it all. The one caveat to this is they aren’t your typical powder noodle, they’re quite stiff, which makes managing them at slower speeds a bit of a chore. Speed is your friend here. Hardpack conditions is where the ski really impressed. A combination of stiffness, side cut, and even tail rocker make this ski a blast during those high pressure days. I was expecting a lot of tip chatter and a squirrely ride with these on groomers. The stiffness takes care of all that, and I couldn’t find a speed limit with these. Another surprise for me came with the tail rocker. On steep, icy chutes I was able to spin the skis down across the fall line with ease. With the tip and tail rocker they skied a lot shorter than a 191 should, which I enjoyed on firm snow. A couple of complaints. The gigantic tip. Not really a problem with the ski, but I did have to futz around with making new tip loops for Black Diamond Ascension skins to fit over the tips. The other complaint is the center mount leaves a lot of tail, add in the tail rocker and kick turns became a little bit of a pain. This entry was posted in Gear and tagged Caylor, ON3P, ski review by Lee. Bookmark the permalink.